It’s been a big week for Liam. He had a few outings, one of which was to see his new friend Seyna who was born on Sunday. There have also been visits from friends and family, and the little guy has been feeling a bit exhausted. So what does one do on a Friday when you are only 22 days old and there have been so many pressing social commitments? You curl up into a ball and go to sleep on mum. Liam celebrated his 21st day like all of the others days so far- drinking milk and lots of sleep. 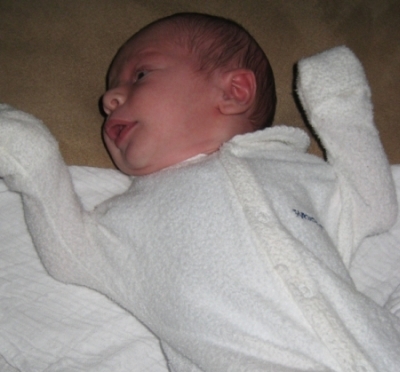 Here he is having a nice stretch on the couch and, like daddy, looking over at the TV. Liam just loves his bath time. Once we make the house warm enough for him he has fun floating while mummy holds him up. Stay tuned for more updates and pics of our little guy. Liam is almost 3 weeks old now and as cute as ever. I am back in the office and Sim and Liam are having fun together at home, although the weather has not been the best to go outside. Here are a few picks of our little guy. As you can see he born was big, beautiful, kissable, red lips! You can click each image for a larger version. It’s a Beautiful Baby Boy!!! We are very proud to welcome our baby boy Liam Harry Collins into the world!! He was born on the Thursday 7th June at 12:44PM, weighing 3.148 kg and 51cm long. Will post some pics and more info soon. Posted in Pregnancy | Comments Off on It’s a Beautiful Baby Boy!! !